Harmonize natural unevenness, asymmetric pattern and complex color to portray the beauty of the nature. and yarn natural flavors and tenderness of materials to preserve their original characters and deliver them into the hands of you. These are what we value for our manufacturing. There may be some translationese in that statement, but if you've ever handled a Noro yarn, you know the statement is also perfectly in keeping with the product. There's very little middle ground with Noro yarns: people either love them or hate them. Many people love the colours, though the combinations sometimes strike us as funny: a yarn that is mostly misty blues and purples may have long sour honks of yellow or green in it. Some find that jarring, but personally, I love it. The acid colour is like a squeeze of lemon or sprinkle of salt in a rich dessert; it keeps it from becoming cloying. The texture, though, is a different story. Most Western knitters, and I think especially American knitters, expect smooth, soft, even yarns. They especially expect these qualities when the yarns are more expensive, as Noro yarns are. Noro yarns defy those expectations. They are highly textural, not always squooshably soft in the skein, and tend to run thick-and-thin. Sometimes there are knots that interrupt the colour progression. There is often vegetable matter -- bits of hay, grass, oat hulls -- lodged in them. Some people object to those qualities. I do not, but I understand the objections. Each skein is its own journey, and not everyone is interested in going along for the ride. I love seeing where they take me, but I also find I like Noro yarns better in small projects, especially in colourwork or stripes where another yarn can mitigate any weirdness in the colour progression. (Noro yarns are great in Faux Isle projects, for instance). Day trips, maybe, instead of long ocean voyages. This hat was a literal day trip -- I started it on a Friday evening after dinner, and was finished by lunch on Saturday. 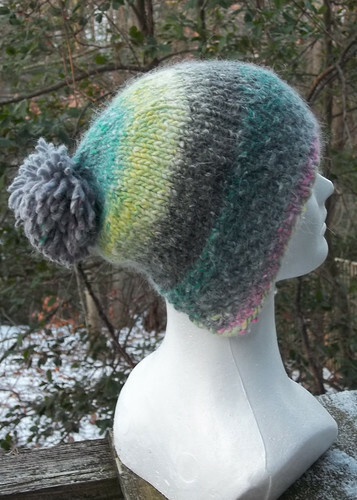 The yarn is Noro's Nadeshiko, a bulky-weight blend of angora (rabbit), wool, and silk. It is not quite what I'd call squooshably soft, but it is soft enough to wear against my forehead and ears, and it is very, very warm. You can also see what I mean about yellow-green in the middle of the colorway, emerging like springtime at the edge of the cold greys and spruces. The pattern, Lomond, has two especial pieces of genius in it. The first is the split brim, which accommodates ponytails and chignons (my two most common hairstyles) with ease. The second is the little bit of short-row shaping in the crown, which does wonders to improve the fit. I'm already ripping through my library of hat patterns, look to adapt them all for those two features. Oooo, that's lovely. Interesting re the yarn. I've seen bolts of silk from Japan and India kind of like the yard you describe - changes in texture due to variations in thread thickness, seemingly-random unexpected color. I admit I like it; it messes with my expectations in typically good ways.